We're located in beautiful Newburgh, Indiana At Newburgh Healthcare Center you will find beautiful surroundings, inside and out. Come visit us and tour our facility We are dedicated to making you feel comfortable. Beauty and Barber Shop Our professional staff will make you feel right at home. Enjoy the outdoor patio We look forward to working with you to reaffirm the confidence in your decision and your trust in us. We provide comfort and care Our on-staff therapists will provide expert care to get you back on your feet. Looking for short-term therapy? Our on-staff therapists will provide expert care to get you back on your feet. Newburgh Healthcare Center is dedicated to meet your health and rehabilitation needs. Our approach to your care includes open communication, availability of certified and licensed professional staff, and a commitment to provide quality services in a comfortable environment. 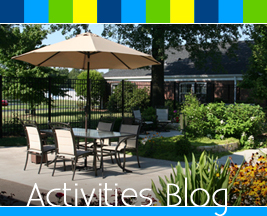 Take a look at how we spend our days at Newburgh Healthcare Center. We have activities suite your needs.